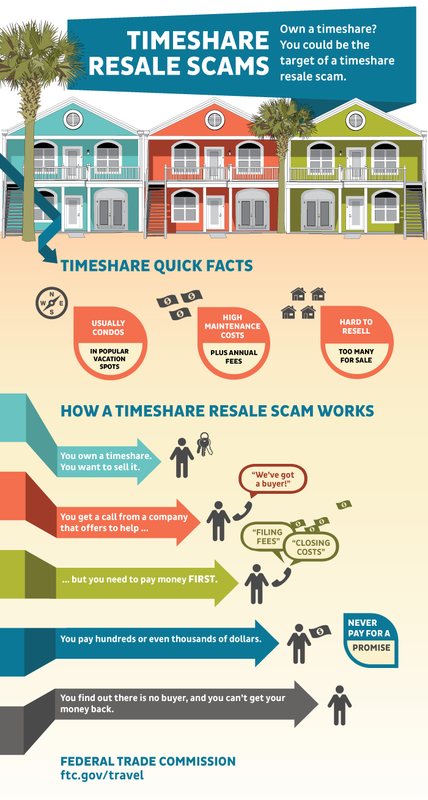 Here is an infographic that I have found on how timeshare scams work. Interesting to know...have you ever been a victim of one of these? This is spot on. I hope this helps someone avoid getting scammed. If these supposed "buyers" were lined up, why aren't they going nuts and buying out all of the timeshares that are on ebay for $1? There are 5 signs to detect if a timeshare resale is a scam: Unsolicited phone calls, they ask you for upfront fees, they do not have real state license, what they offer sounds unrealistic and the high closing costs. BlueGreen Vacations Timeshare Scam Warning!! !